Post by the Hawthorne Hawkman, photo from the Hennepin County Sheriff's Department. There has been a long-standing theory put forth by many NoMi bloggers, that when an unscrupulous investor picks up a property though mortgage fraud or slumlord tactics, the property then cycles through a series of such owners. This has been borne out through Boler/Newell fraud properties being bought by Danna D III and TJ Waconia homes purchased by Robert Serr, among others. So when the Strib broke the story about the "Beat Down Boys" and their ties to at least seven properties where mortgage fraud occurred, I wanted to find out which houses they were. 3751 Logan Ave N, Gustafson's home, assault occurred there. 3315 Nicollet Ave S #1, Neuberger's apartment, drug deal negotiated, but did not occur there. 3618 Washburn Ave N, where sale of cocaine occurred. 3414 James Ave N, sale of cocaine occurred. 3638 Sheridan Ave N, home of Jessie Hoff, another member. Illegal firearms sale occurred there. 2615 Newton Ave N, mortgage fraud, destroyed by fire four months after purchase. 4759 Washburn Ave N, mortgage fraud. 901 Lowry Ave NE, mortgage fraud, foreclosed less than a year after purchase. 3500 Queen Ave N, mortgage fraud, no payment made, home destroyed by arson. 2607 Morgan Ave N, mortgage fraud, foreclosed. 6182 Zealand Ave N, New Hope, mortgage fraud, meeting place for some Beat Down Boys meetings, foreclosed. 3214 Vincent Ave N, mortgage fraud, foreclosed. The property info look-up service on the City of Minneapolis website has been acting up, at least on my server. Links and other information will be added later. Post by the Hawthorne Hawkman, photo from Minnesota Public Radio. The following press release was sent to me and I encourage fellow NoMi residents to attend and spread the word. MINNEAPOLIS, MN - On March 18th ten of the Twin Cities most inspiring changemakers will take the stage at the historic Capri Theater in North Minneapolis for an evening of short, inspiring presentations. SOLUTIONS TWIN CITIES VOLUME 4, the latest in the series of Solutions Twin Cities events designed and presented by Works Progress, aims to spotlight this eclectic array of creative ideas and people while providing a unique opportunity for the community to connect. Audiences will encounter surprising stories of community-based innovation from a cross-section of our cities emerging and established leaders. Since 2007 Solutions Twin Cities has facilitated presentations by an expansive array of individuals - from artists to economists, scientists to urban planners, and community organizers to entrepreneurs. This event marks the return of this popular series after a 2-year hiatus. The group behind SOLUTIONS TWIN CITIES VOLUME 4, the arts collaborative Works Progress, hope that this event will help to spread the word about some of our local innovators and their world-changing ideas. Works Progress also hopes that Solutions Volume 4 will inspire people in the Twin Cities and beyond to get involved in actively shaping their world. 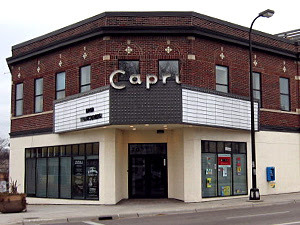 The recently renovated Capri Theater is located at 2027 West Broadway Ave Minneapolis, MN, 55411. Doors will open for Solutions Volume 4 on Friday, March 18th at 6:00 PM. The event will take place from 7PM to 9PM, with a reception to follow. Tickets go on sale February 18th for what is sure to be a sold out show. Tickets for SOLUTIONS TWIN CITIES VOLUME 4 are $8 to $16 (pay what you can), and can be purchased online (beginning February 18th) or at the door. Guests also have the option to sponsor a ticket. Sponsored tickets will be distributed by Solutions Twin Cities event partners to adults and teens in our community. 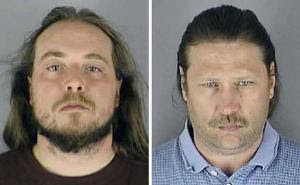 Solutions Twin Cities was created by college friends Troy Gallas and Colin Kloecker in 2007. Gallas and Kloecker desired a platform for creative people in the Twin Cities to tell their stories, and decided to pioneer this interdisciplinary live event format. In 2008 Gallas, Kloecker and collaborators co-founded the group Works Progress and expanded their scope to include a wider range of community-based programs and projects, including the popular series Give & Take and Salon Saloon. Post by the Hawthorne Hawkman, stock image from www.failblog.org. In some recent posts about Paul Koenig, one or more anonymous commenters have said that Paul Koenig is at least partially a victim of bad timing, and have defended him to varying degrees. I've stuck to my opinion that, no, Koenig is pretty much the main character at fault and brought about his own financial demise. In so doing, I've repeatedly said that Mr. or Mrs. Anonymous should show me somewhere in either the Koenig loan documents or the FDIC-mandated plan where Minnwest is either forced or allowed to arbitrarily change various terms on Koenig's loans. 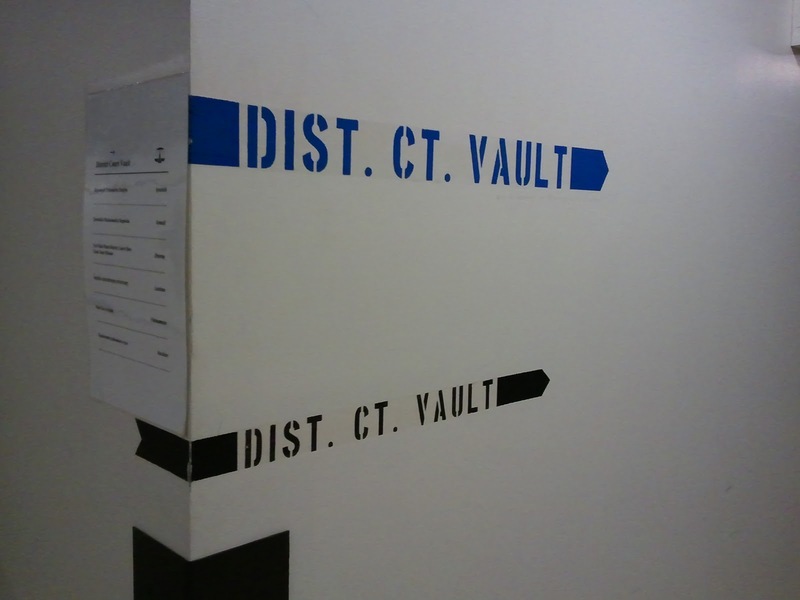 Post by the Hawthorne Hawkman, image from the Investigative Reporting Workshop blog. There's a financially nerdy aspect of the Minnwest vs. Paul Koenig legal showdown that I don't think should get lost in the shuffle. 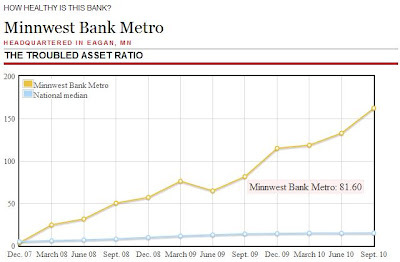 Last year, I compiled quite a bit of information on Minnwest in a Johnny Northside post called "Minnwest Bank Metro - Breaking the Bank." There's quite a bit of technical stuff to digest there, but the key point in relation to this post is that Minnwest was found to have a dangerously high level of bad commercial debt in comparison to their total assets. That's a red flag for regulators. The Investigative Reporting blog link above is helpful because you can drag the mouse over various points on their graphic to see exactly where Minnwest stood from one quarter to the next. The statistic shown there is slightly different. It compares the sum of troubled assets with the sum of tier 1 capital plus loan loss reserves. Basically, the amount of bad debt compared to two kinds of assets a bank has. I'm pointing out the obvious when I say that the higher ratio this is, the worse off the bank, its shareholders, and those who hold deposits are. Readers are encouraged to compare the blue line (national median) to the yellowish line (Minnwest's ratio). The troubled asset ratio comes into play because thanks in part to Paul Koenig's and Pamiko's massive loan defaults, Minnwest Bank was put on notice by the FDIC that they had to improve those numbers--or else. That order happens to be exhibit 30 in our court case. Granted, Minnwest made a rash of high-end bad commercial loans, such as when they wound up holding the bag on the failed Ramsey Town Center. But let's take a look at that graph above and see what connections there are to Koenig's mass foreclosures in Minneapolis and St. Paul. In the case of the $1.3 million-dollar loan at 4652 Aldrich Ave N, the sheriff's sale was scheduled in the last quarter of 2009, coinciding with a huge jump in the troubled asset ratio that quarter. That was also the same quarter when 2420 Bryant Ave N ($2.5 million) had a sheriff's sale scheduled, although the intent to foreclose was filed one quarter earlier. The 1417 Logan Ave N property ($1.5 million) followed the same pattern as the Bryant loan. According to the Complaint documents, Koenig's St. Paul property ($1.1 million) was foreclosed in the same quarter of 2009 as well. While I can't say with certainty when exactly the $6.4 million total default bomb exploded onto the chart above, there can be little doubt that the series of Pamiko foreclosures directly led to Minnwest being on the FDIC's naughty list. Watch out banks, this is what lending to Paul Koenig can do to you. On an appropriate note, since this post was finished after midnight, it officially hit on the 1-year anniversary of Pamiko Comeuppance Day. Happy Pamiko Comeuppance everyone! When we last touched on Paul Koenig's court proceedings, he had just transferred at least a half-dozen properties to his name, and then shifted title to a new LLC, Komo Group. Minnwest alleges, and I agree, that such a purchase and transfer didn't even satisfy the basics of title transfers and foreclosures in Minnesota. Koenig and at least one anonymous commenter here feel otherwise. New City Website to Hold Slumlords Accountable! Post and photos by the Hawthorne Hawkman. 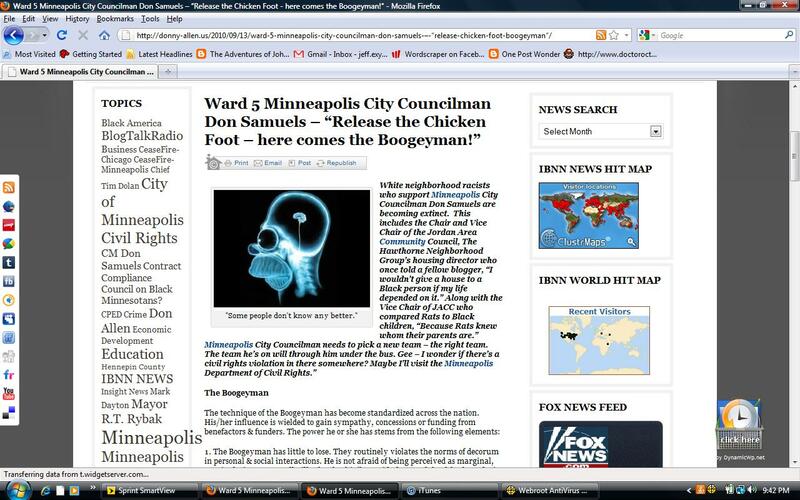 Stock photos are of Gregge Johnson properties, as he was a north Minneapolis slumlord who is listed on this website. Another Johnson link can be found here. Several months ago, city officials had spoken both privately and at Councilmember Hofstede's 3rd Ward CARE meetings about the prospect of creating a "Slumlord Hall of Shame" on the Minneapolis city website. Even though the plan was discussed openly, northside bloggers held off on announcing anything prematurely due to the fact that the city attorney's office and others were reviewing exactly what kind of content would be there. Well, the link is live now. In all honesty, this so far seems too dry. I was hoping for something closer to the Allentown, PA website, which goes right to the point and calls it a Hall of Shame. In one instance, the Allentown mayor took a sledgehammer to a slumlord's building as part of a ceremonial start to the demolition process. Their website shows the dilapidated buildings of slumlords and also posts pictures of the ritzy houses where they either live or receive mail. It sure would be nice if our mayor went on record and publicly shamed slumlords who were costing our city over $35,000 in unpaid fines. Northside bloggers could focus our efforts on other things then. But this site for Minneapolis is a good beginning. For one thing, it starts to come up with empirical, standardized ways to classify someone as a slumlord. Hopefully its features are expanded, and that one day we'll be able to search the city database using property owner names as criteria. When I first decided to track my purchases to a NoMi connection, the main item I worried about was where I would find comic books, graphic novels, and other geeky paraphernalia. I searched and searched for this connection until, like the Hawkman as he found Shelia Saunders and knew she was the reincarnation of his immortal soulmate Chay-Ara...too nerdy? Blame Wikipedia. Riverfront Design #3 is a Win-Win-Win for Hawthorne! Post by the Hawthorne Hawkman. Photo of Tom Leader Studio team from an email sent on the Upper Willard-Homewood (U-WHO) listserv. Earlier today, The RiverFIRST proposal for the Minneapolis Riverfront Design was named as the winner out of four proposals. But in reviewing their video, which can be found here, the real winner is the Hawthorne neighborhood. The video is about eight and a half minutes long, but the first five minutes are dedicated to our side of the Mississippi. Northeast gets a measly 3:30, so there. Maybe we won't charge a toll for Nordeasters to come across Lowry and visit our spiffy new land bridge. Oh yes, a land bridge. The big issue that this proposal caught (perhaps the others did too; I haven't watched all of them yet) is that there is a disconnect between north Minneapolis neighborhoods and the River. Here I was, asking pretty please for maybe a 50-foot strip of a bike path connecting 26th to nearby parkland. And what gets proposed instead? Let's take dirt from the bottom of the Mississippi and use that to help make a bridge several blocks long that spans Highway 94, expands park land, and connects Hawthorne to the River through walkable venues. I'm blown away here. Post by the Hawthorne Hawkman, video from the Youtube channel of Craig Stellmacher. This video popped up from a friend's Facebook feed this morning. I don't know the artist or which houses he was in. But it's well done and serves as a reminder of the effects of foreclosures in Minneapolis. Post by the Hawthorne Hawkman, screenshot image from an ibnnnews post dated 9/13/10. As the tempest in a teacup over NoMi blog wars builds up, I felt that my own experience should be part of the discussion. In the fall of last year, the Irving Inquisition did a series of posts about what he alleged as Don Allen's criminal background. (Don Allen has disputed much of that content.) The day after one of those blog entries, which did not involve me in any personal or professional manner, Don Allen made numerous calls to the Hawthorne office and threatened to sue me in relation to one or more posts on that site. He also threatened to sue Eric Johnson, John Hoff, and Michael "Kip" Browne. The day after that, I saw the post above on Don Allen's website. In the opening paragraph, he claims: "...The Hawthorne Neighborhood Group's housing director who once told a fellow blogger, 'I wouldn't give a house to a Black person if my life depended on it.'" That statement is of course categorically untrue, and so laughably fabricated that I felt no need to respond at the time. But as the veracity of some of Mr. Allen's blog posts and comments regarding north Minneapolis bloggers is called into question, this incident has to be added to the mix. One final note: Given the propensity lately for identities of well-known NoMi-ites to be "borrowed" for blog comments, I will only publish comments here from people who use verifiable email addresses and/or internet profiles. If you want to comment anonymously, there are plenty of other sites discussing this topic where that can happen. After foreclosure, Paul Koenig paid $1 for this. 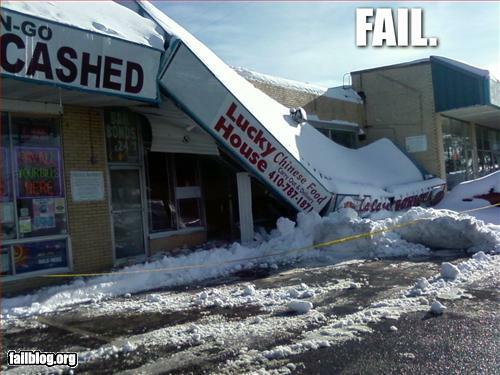 After foreclosure...well, you get the idea. Should Paul Koenig buy a cheeseburger at McDonald's, or a house? With $2, he can have BOTH! 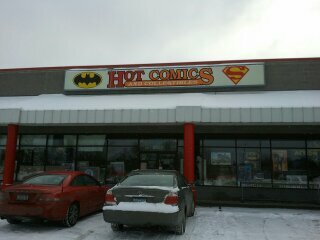 Post and photos by the Hawthorne Hawkman. Photos originally appeared on the JNS story, "Pamiko Property Photo Tour." I'll give Paul Koenig this much: he's got chutzpah. What he is trying to do to retain ownership of "his" properties in NoMi (and a few in south) is nothing short of astonishing. Koenig bought dozens of houses in Minneapolis, and at least one commercial building in St. Paul with four loans from Minnwest Bank totaling roughly five million dollars, and another half-million from Aspen Financial. These commercial loans were cross-collateralized, a procedure that looked awfully suspicious to many, but may have been at least somewhat of a solid business practice. Cross collateral means that several properties were the collateral on more than one of the million-dollar lines of credit. The reason for this is so that if some properties go vacant, in need of repair, or otherwise stop producing income streams to support loan payments, spreading them out this way creates an intermixed income stream to support several lines of credit simultaneously. In the business world, this model apparently works rather well, provided your borrower isn't a flat-out lying scumbag.